Tip. Some users might complete the goal somewhere other than on the site, such as by making a phone call. To count these users, configure transmitting call tracker data to Yandex.Metrica. Then you can add calls to Yandex.Metrica reports and also use a special group of reports. In the Yandex.Metrica interface, go to Settings → Goals. Set the option to Multi-step goal. Click Add goal. The created goal is shown in the list of goals. Click Save. Yandex.Metrica begins collecting statistics within a few minutes after saving settings. “url: matches” Specify the full URL of the target page. Specify part of a URL. Use this option if there are multiple target pages and they can be combined with a single condition. Specify as much of the URL as possible so the goal is completed only on the desired pages. If the condition is /abc, the goal will be completed on the pages example.com/abc-1, example.com/abc/2, and example.com/abcd. Only the first part of the URL is specified. Use this condition if you want to track views in subdirectories. If the condition is http://example.com/abc/, the goal will be completed on the pages http://example.com/abc/1, http://example.com/abc/2, and http://example.com/abc/1/2/3. “url: regular expression” Used for tracking URLs that match a custom pattern. If you want the goal to be completed for pageviews with URLs containing the + sign, put %2B in the template in place of the + character. See the examples for using “url:” criteria. For the condition, choose “goal ID event”. A goal may contain a maximum of five steps. Each step can have up to 10 conditions. Don’t forget that each step must require completing the previous step. 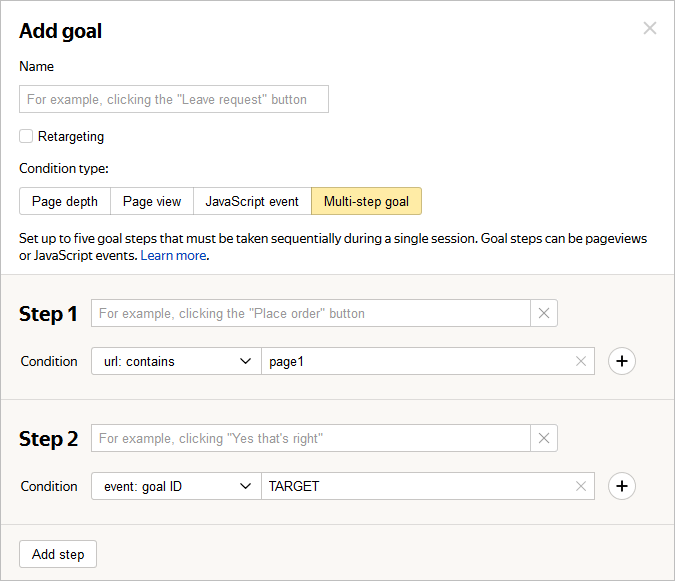 For example, if a user can skip the first step and immediately perform the second step, the goal is not considered completed. The steps don't have to be completed directly one after another. On their way to the goal, users might visit different pages of the site and perform other actions not related to the goals of the steps. The steps must be completed during a single session. Conditions in steps are combined with the OR operator, so the goal is considered completed if at least one of the set conditions is met. The tag owner's site has a “Sign up” link (http://example.com/registration/). When a user clicks the link, it opens a form to fill in with the “Submit” button. Set the type of condition to “url: contains”. In the form on the site, use the reachGoal method. It is called when the goal is completed (in this case, when the user clicks the “Submit” button). 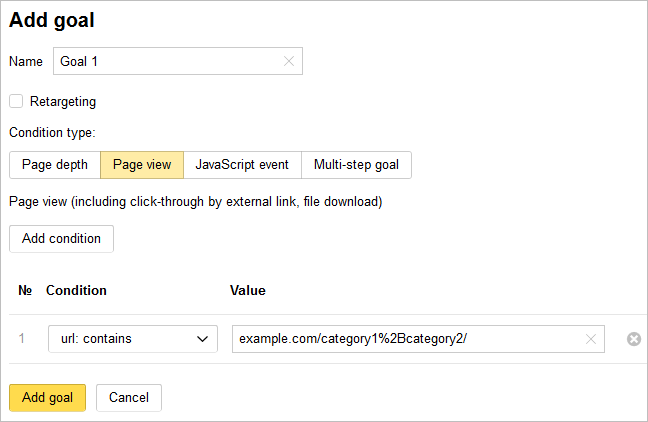 In the Yandex.Metrica interface, choose the “event: ID” condition, and specify the goal ID set in the reachGoal method.